Total emissions from enteric fermentation was identified as a key category in Japan’s 1990 inventory, and are still a key category in the latest inventory submission (NIR 2018). Nitrous oxide from manure management, but not methane from manure management, is a key category. Japan reports enteric fermentation emissions from dairy and non-dairy cattle using a Tier 2 approach. A Tier 1 approach is used for enteric fermentation from all other livestock types. Methane emissions from manure management are estimated using a Tier 2 approach with a combination of country-specific and default emission factors, depending on the manure management system. Japan’s specific approach adopted for both enteric fermentation and manure management methane emissions has evolved over time. *Tier 1 approach with country-specific emission factor. Why was this approach adopted? Following the IPCC Guidelines, Japan adopted a Tier 2 approach, but decided to follow the common practices in Japanese livestock research of estimating emission factors on the basis of dry matter intake. Description of approach: Japan’s country-specific model is based on a relationship between emissions and dry matter intake (DMI). The approach has evolved over time through changes in livestock categorization and methods used to estimate DMI of different cattle sub-categories. where Y is the volume of methane generated (liters/day) and X is dry matter intake (kg/day). Japan’s inventory continues to use this equation. Emission factors for each type of animal are estimated using average dry matter intake as recorded in the Japan Feed Standards, which is compiled by the Japan Livestock Industry Association. In the feed standards, DMI is estimated using an equation based on fat corrected milk yield, body weight, and daily weight gain by daily growth, where fat corrected milk is updated on the basis of annual official statistics. 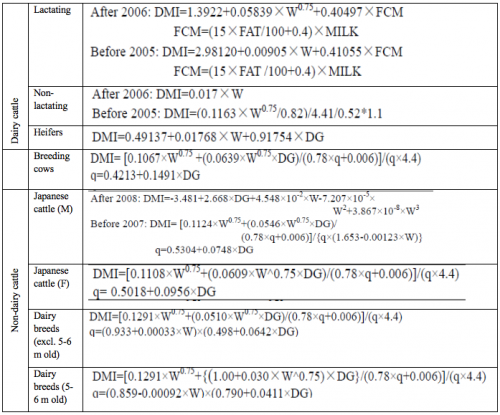 In 2006 and 2008, the equations used to estimate DMI of different sub-categories were updated for dairy and non-dairy cattle, respectively (Table 2). W: weight, FCM: fat corrected milk, FAT: fat content of milk, MILK: Milk yield, DG: daily growth, q: energy metabolic rate. Livestock population numbers for each type of cattle come from official statistics documented in a survey at 1 February each year by the Ministry of Agriculture, Forestry and Fisheries. Initially, inventory sub-categories included 3 types of dairy cattle (lactating, dry and heifers) and 4 types of non-dairy cattle (breeding cows, fattening cattle <1 year and >1 year old, and dairy breeding animals). The inventory excluded cattle under 6 months old, which were assumed to account for 50% of the population of cattle categories under 1 year old. Subsequently, 5 and 6 month old cattle were identified as a separate sub-category, and fattening cattle were divided into male and female sub-groups of different ages and sub-groups defined by breed (NIR 2006). An inventory review in 2016 pointed out that cattle over 3 months old emit methane, and in NIR 2017, calves between 3 and 6 months were added as another sub-category. Japan has undertaken studies to compare the results of estimation using its country-specific approach and the IPCC model. Using available national data and IPCC default values for Ym, Cfi and Cpregnancy, enteric fermentation emissions were estimated using the IPCC model. The results show that there are no significant differences between the estimates made using the two approaches (Figure 1). In its early inventories, manure management methane emissions from cattle, pigs and poultry were estimated using measurements conducted on different manure management systems in Japan (JLTA 1999; JLTA 2002; Fukumoto et al. 2001). Subsequently, a mixed approach was adopted whereby national emission factors were used if there was reliable data, and IPCC default values were used if appropriate EFs from other countries were not available (see Inventory Practice: Choice of emission factors in Japan). EFs established using Japanese research are based on direct measurements, and the use of country-specific values has increased over time. For example, NIR 2018 uses country-specific values for the methane EFs from pit storage and biogas digesters. This was based on actual measurements in 9 regions of the country using the floating chamber method (MAFF 2012). The integrated EF for the country is the average of regional EFs weighted by the dairy cattle population in the country (NIR 2018). Note: D = IPCC default; J = Japan; O = other countries; Z = not applicable. Data on the proportion of animal waste managed in different systems derived from different sources. In 1997, a survey was conducted prior to enforcement of the “Act on the Appropriate Treatment and Promotion of Utilization of Livestock Manure”. This act prohibits inappropriate manure management practices and induced changes in the proportion of manure managed in different systems. A second survey was conducted in 2009, and data for years between 1997 and 2009 were interpolated. From 2009 onwards, results of an annual national survey conducted by MAFF have been used. For cattle, the uncertainties of emission factors were calculated by finding the 95% confidence interval in accordance with the equation used to estimate the emission factors (Dairy cattle: -26% to +32%, non-dairy cattle: -40% to +49%). Populations of cattle (activity data) are based on data from the official Livestock Statistics, but standard error for cattle is not described in the official statistics. Therefore, the uncertainties for activity data were substituted by 1% error estimated for swine in the Livestock Statistics. As a result, the uncertainties of the emissions were determined to be -26% to +32% for dairy cattle and -40% to +49% for non-dairy cattle. The uncertainties for emission factors of livestock other than swine were apply the 50% default data given in the 2006 IPCC Guidelines. For the uncertainty for activity data of swine, 1% of standard error for swine given in the official Livestock Statistics is applied. For activity data for livestock other than swine, uncertainty was substituted by the value for broilers (9%) described in the Livestock Statistics. As a result, the uncertainties of the emissions were determined to be -72% to +157% for swine and 51% for buffalo, sheep and goats and horses. Y. Fukumoto, et al. 2001. Measurement of NH3, N2O and CH4 emissions from swine manure composting using a new dynamic chamber system, Proceedings of 1st IWA International Conference on Odor and VOCs Measurement, Regulation and Control techniques. Australia pp 613-620. Ministry of Agriculture, Forestry and Fisheries of Japan, the Project on Survey and Investigation for Elaboration of GHG Emissions from Agriculture, Forest and Fisheries Sector, within the Project on Development for Method of Promotion for Countermeasures of Global Environment in the Agriculture, Forest and Fisheries Sector in FY2011, 2012. Shibata, Terada, Kurihara, Nishida, Iwasaki. 1993. Estimation of Methane Production in Ruminants. Animal Sciences and Technology, 64(8).